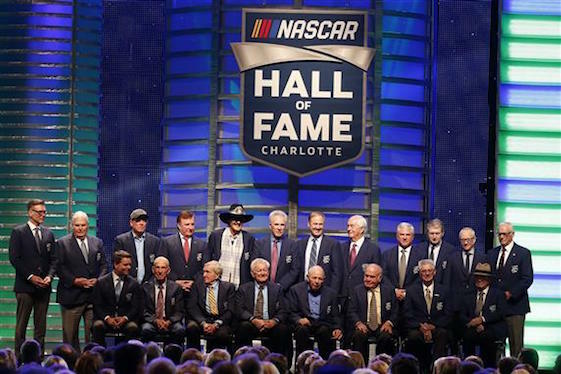 CHARLOTTE, N.C. – Watching common men do uncommon things is what made NASCAR’s popularity explode in the late 20th Century, but it also defines this year’s NASCAR Hall of Fame class that was inducted Friday night. Alan Kulwicki won the 1992 NASCAR premier series championship on a budget of less than $3 million. Davey Allison won two races and five poles in his rookie season. Jeff Gordon became the youngest driver in NASCAR’s modern era to win a premier series championship, eventually collecting four titles and 93 victories before retiring. Roger Penske worked in a service station as a teenager and later became a successful driver before deciding to become an international businessman and focus on team ownership. Jack Roush came from a small Kentucky town, earned a college degree, built Roush Industries and a formidable sports car racing operation before deciding to take on NASCAR in the late 1980s. In many ways the five are linked. They all competed against each other, a first for a NASCAR Hall of Fame class. Gordon’s inaugural premier series race was the one in which Kulwicki claimed his championship. Kulwicki and Allison were linked religiously, as both were Catholic, a rarity in the overwhelmingly Protestant sport. Kulwicki wanted one of Allison’s sisters to oversee his fan club during his rookie season, but she was concerned her brother and Kulwicki might compete against each other so she declined. They ended up running for rookie honors in different years, but then died just three months apart, both in aircraft accidents. Ironically, Allison lost the ’92 championship due to a wreck on the Atlanta track’s frontstretch. The night of Kulwicki’s Wake in Wisconsin, as Allison walked from the funeral home, he commented that he now knew why it wasn’t meant for him to win the championship. Little did he know he would never have another shot at a NASCAR title. However, it wasn’t solely the way in which the five men’s careers were often intricately entwined that provided the class with a special feeling. It’s because I covered all of them and actually worked for one of them; therefore, I knew them as people, not just for their racing accomplishments. Allison was the person most responsible for Robert Yates becoming a car owner. When Harry Rainer was ready to leave the sport, Yates was his team’s head engine builder. The Charlotte, N.C., native didn’t know if he could transition from engine builder to team owner. Allison convinced him he could. Emotion always ran high with Allison. His anger once consumed him after a Talladega race and he broke his hand when he hit the team transporter with his fist. Allison once needed to hold his young daughter in his arms so he could control his temper while he met with the media after a late-race crash in the Daytona 500. Allison was full of mischief. After discovering I was ticklish, he would often stalk me in the garage, much like Snoopy did Linus in the Charlie Brown comic strip. With a grin on his face, Allison would sometimes seize a quick opportunity to poke me in my side. It was those type antics that nearly caused both of us to be removed from a driver’s meeting in Dover. When Kulwicki arrived in North Carolina, Griggs Publishing, the owner of the weekly newspaper Winston Cup Scene, “adopted” the young driver. He was always included in the newspaper’s social activities. Sometimes Kulwicki would bounce ideas off the newspaper’s executive editor Steve Waid, who received the Squier-Hall Award Friday night, as well as me. When everyone sought shelter in their warm hotel rooms during the 1993 snowstorm that forced postponement of the spring Atlanta race, Kulwicki was in the track’s garage. Wearing his driver helmet, Kulwicki worked on his race car in the open garage during the freezing cold and snow. Of course, Kulwicki didn’t work all of the time. His favorite TV show was “Alf”. I began covering Roush when he was consistently winning IMSA championships with Ford and driver Scott Pruett. Roush was a workaholic with an appetite for intensity. Yet, he always had time to talk about engines and was generous with his time whenever I needed an interview. He loved flying, but nearly lost his life in two crashes. The second crash cost him his left eye. When watching a NASCAR or Indy Car race, one often sees Penske’s stern face. The astute businessman’s tremendous passion for racing is infectious and working for him is an education. During the four years I oversaw media/community relations for Penske Racing South, I learned the importance of continuity and how to show compassion while being an effective leader. His work ethic constantly demands the best from a person, but he always knows when family needs to come first and what is occurring in each employee’s life. When he would arrive at the Mooresville, N.C., race headquarters he would come to everyone’s office for a short visit before starting his meetings. And Gordon, well, I watched him grow from a talented youngster with bushy eyebrows and mustache into a polished young man who was as comfortable hosting “Saturday Night Live” as he was representing NASCAR as its champion. He was “The Kid” when seven-time NASCAR champion Dale Earnhardt was “The Man”. Gordon toasting Earnhardt with milk and Earnhardt returning the toast with champagne in the Waldorf-Astoria Hotel Ballroom during Gordon’s first championship celebration is forever etched in my memory. Gordon’s professionalism has never wavered, no matter his age or the issue. And when Rick Hendrick one day decides to hand the reins of Hendrick Motorsports to Gordon, there is no doubt the California native will guide it with the same steady hand. While this NASCAR Hall of Fame class is exceptional to many people for different reasons, it will always be the group of men who are special to me because I knew them as people; not just competitors.